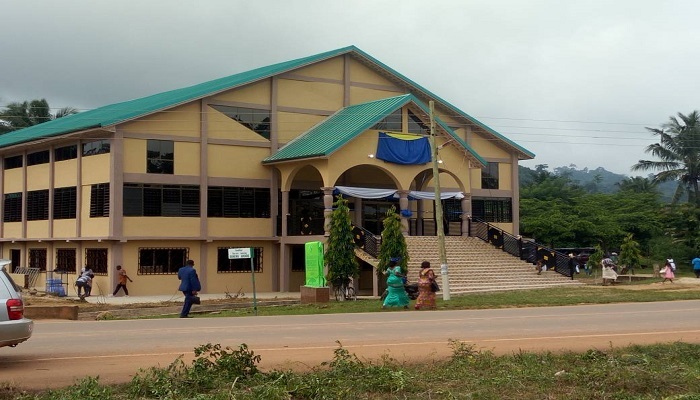 The newly constructed mega auditorium of Mfuom Central Assembly in the Dunkwa Area of The Church of Pentecost has been dedicated and named after the late Apostle Benjamin Kofi Swanzy. The GH¢287,000.00 edifice was dedicated on 22nd July, 2018 by the outgoing Area Head, Apostle John Osei Amaniampong, assisted by the Mfuom District Minister, Pastor Akwasi Adomako Boakye, and the Area pastorate. Mfuom Assembly was established in 1982 under the leadership of Apostle B. K. Swanzy, the then Area Head of Denkyira-Sefwi Area, and Pastor Kutin Buah, the then Dunkwa District Minister, following a gospel campaign at the community. Members initially fellowshipped in a classroom and later moved to a private residence of one of the members. With an increase in membership, they acquired a permanent a parcel of land in 1986 to put up a permanent place of worship. The sod cutting ceremony for the commencement of the project was performed on 25th October, 2013 by Apostle Samuel Badu Nyarkoh, the then Area Head. The edifice was named after late Apostle B. K. Swanzy to honour him for the role he played in the growth of the Church in the Dunkwa Area. Apostle B. K. Swanzy, a native of Agona Wassa in the Western Region, was born on 5th February, 1930. He started basic education at Agona Wassa and completed middle school at the Tarkwa Methodist School. He accepted Jesus Christ as his Lord and Saviour and baptised in 1944. He was called into full ministry in 1957 and stationed at Wassa Manso same year. He served as Dunkwa Area Head from 1984 to 1989. He was known for his strong sense of spirituality. He made great impact with melodious songs and sound biblical teachings. He was a great soul winner and missionary, being one of the ministers of the Church who pioneered the work of God in Cote d’Ivoire from 1968 to 1975. He was a faithful servant who worked with Church policies, doctrine and constitution. Preaching the sermon on the topic, “Do Not Imitate Evil, But Imitate Good” based on 3 John 10-11, Apostle John Osei Amaniampong admonished believers to be imitators of good works not bad ones. Using Gaius and Diotrephes as examples, he said Apostle John applauded Gaius for living out the teachings of the Apostles and welcoming Christian missionaries into his home, describing him as faithful and hospitable. The Area Head said faithfulness gives glory and honour to God. According to him, Apostle John encouraged Gaius to continue his hospitality towards missionaries and asked the Church to imitate the good deeds of Gaius. On the other hand, the Apostle John condemned Diotrephes for being a selfish leader who did not only refused to help itinerant godly teachers, but slandered and opposed those who disagreed with him. According to Apostle Amaniampong, Gaius was a person who always wanted divisions in the church, a person who disobeyed the Apostles, was power drunk and always brought rivalry. He, therefore, encouraged Christians not to imitate evil character but be examples of Christ. Report by Pastor Twene Adane Justice, Dunkwa Atechem District.